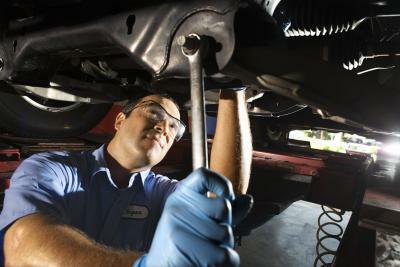 Automotive repair labor guides go hand in hand with flat-rate labor. This involves a standard of service in the automotive repair industry to protect the customer from being overcharged as well as the repair facility to profit from the repair. While the technology of vehicle designs evolve, constant changes in the repair industry require ongoing training in the field to keep up with new challenging types of repairs. And most vehicles--even if the model is the same--offer more than one option on engine size. The three most common repair labor guides found in most automotive repair shops are Chilton's, AllData and Mitchell. With the level of technology we have today, these manuals are now available on the Internet, but the information is expensive and most often requires monthly fees and upgrade charges for new year vehicles. Standards of service in the automotive industry makes an example of protecting the repair facility of profit loss more so than protecting the customer of being overcharged. However, reputable shops will offer a pre-inspection of the vehicle and then present an estimate on the cost to replace and repair it by applying the labor guide. This protects the customer by showing what needs to be replaced, how long it will take to replace and the charge for the entire repair--start to finish. Flat-rate labor is applied to labor guides. 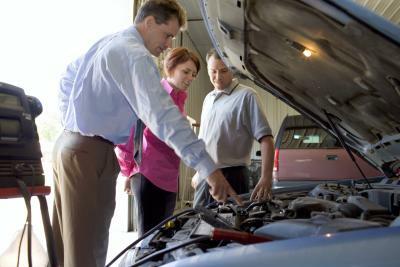 A certain amount of time is involved on replacing a car starter on a certain year, make and model vehicle. If the labor guide dictates it takes 2.3 hours to replace the starter, then the customer pays for the new starter, plus the 2.3 hours of labor to install it. As long as nothing happens during the procedure where another part is compromised, the charge remains the same regardless of the amount of time it took the technician to replace the starter. This is good for the customer if it took three hours for the technician, but what if he got it done in an hour? That's where you pay for the tuition and tools of the qualified technician. 2.3 hours of labor are still applied to the repair bill. Why? Technicians average $10,000 in tools they have to buy themselves. Often times, there are tools available that make the job easier, or the technician has done similar repairs so often, that he has become overly efficient in replacing the part. This is where the profit of the flat-rate labor and the automotive repair labor guides keep the repair facility in business. Labor guides are almost always displayed by applying two separate categories. Repairing cars in geographical regions that experience severe winter conditions and where sand and salt are applied to the roads for an extensive amount of the year, are much harder to work on then areas that do not. Rust and corrosion often require more tools and more time to replace the same part, regardless of where the car is located. Regular flat rate and severe-condition flat rate are displayed in the guides under the same component being looked up to replace. If you live in an area where severe winters occur, you can guarantee that you're going to be charged the severe-condition labor rate listed in the labor guide. Other unforeseen variables can occur when repairing the estimated component. When this occurs, the national standards of service are protected by law to increase your estimate no more than $100 before having to contact you. If other components are required for removal to obtain access to the part being replaced, and then they break during the removal process, instead of being charged for the estimate you approved, you're going to pay more for the additional repair to fix the vehicle. Whether is was a case of shoddy workmanship, you may never know. A reputable repair facility may have also informed you of the challenges they are facing to repair the vehicle when delivering the estimate to you based on the repair labor guide.